The 78A Red Tunnel Tarantulas (clear) are a perfect, all-around longboard wheel. Grippy. Fast. And a beautiful old school red! Tunnel Tarantulas – The design process for the 70 mm Tunnel Tarantula wheel brought together the top skateboard engineers, riders, and those of us at Tunnel. 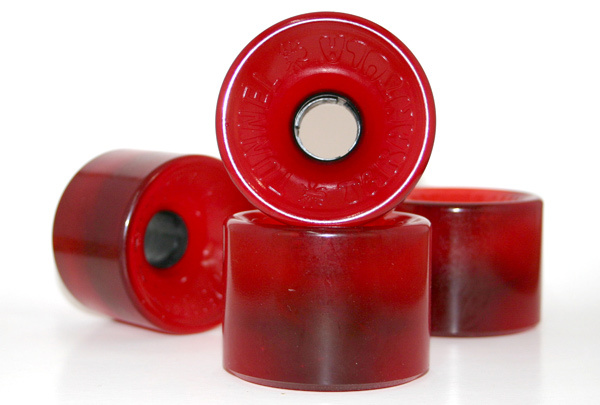 Our Tarantula Wheels are poured in Huntington Beach, California of extremely high quality urethane and have the rebound and grip that skateboarders crave. An off-set bearing placement with a core results in quick turning and the Tarantula Wheel features the Tunnel specialty, an outside “Tunnel” lip that grips the road like no other design. With a height of 70 mm and a width of 52 mm, it’s a great size for conquering any hill.